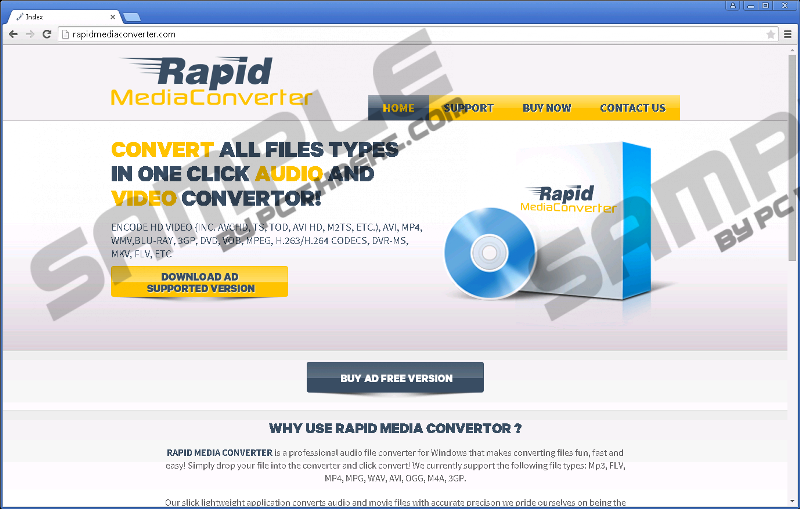 Rapid Media Converter is one of those adware programs that seek to enter target system masquerading themselves as legitimate programs possessing specific beneficial features. However, you should remove this program, because all the media file converting capabilities it boasts of having are nothing more than a marketing scam. Rapid Media Converter might work and convert all the files you need, but you should also be aware that this is not everything this application does. The presence of Rapid Media Converter might also result in more third-party commercial ads on your web browser. Thus, according to security experts, this converter tool is an advertising-supported program that exhibits all the characteristics that make adware dangerous. We encourage you to delete Rapid Media Converter, because its functionality can be soon overshadowed by numerous security risks it might be the cause of. Rapid Media Converter comes in two versions, one of which is advertisement-free, while the other, which is free of charge, is used as an ad-supported platform. Both these versions are accessible via rapidmediaconverter.com, but that does not mean that the ad-supported version of this program cannot find its way to your system in some other way. In fact, you can find Rapid Media Converter on software bundles that are distributed on third-party sharing sites and might include not one but multiple free applications and utilities. Be especially careful when installing these software packages, because you might accidentally proceed with the installation of some unwanted components that can be potentially dangerous. The developers of this program are open about the advertisement showcasing that this converter program engages in (see the EULA on the aforementioned site). We warn you that third-party ads might appear on various sites, not only of the commercial type. And those ads will be annoying. What the developers of this program fail you to warn about is that the promoted advertising material might soon turn into a nuisance that you will wish to get rid of as quickly as possible. Besides that, we strongly urge you not to click on the promoted ads, because, typically to adware, they might reroute you to sites filled with malware or other dangerous content. We hope you are ready to remove Rapid Media Converter from your system. There are two ways that you can do this: manually and automatically. Manual removal consists of relatively simple steps that are necessary to get rid of this adware once and for all. Still, it is always recommended that you opt for the automatic removal, because it is the most reliable way to make sure your system is purged not only of Rapid Media Converter, but also of additional infections that might have sneaked onto your PC. Open the Charm bar and then choose Settings. Click Control Panel in the menu on the right. Under View by, switch to Small Icons. Open Programs and Features and select Rapid Media Converter in the program list. Click Uninstall to remove the selected program from your computer. Click the Start button to open the Start menu, and then choose Control Panel. Open Programs and Features and select Rapid Media Converter. Click Uninstall to remove the unwanted app. Choose the Category View on the left, and then open Add or Remove Programs. Select the unwanted application in the program list. Click Remove to delete the selected application. Quick & tested solution for Rapid Media Converter removal.